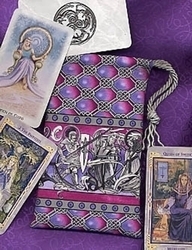 Wide Tarot Bags - Morgan LeFey Wide Tarot Bag - Tarot Bags, Tarot Cards, Cloths, & More! The inhabitants of the court of Camelot are shown on this Arthurian style bag. 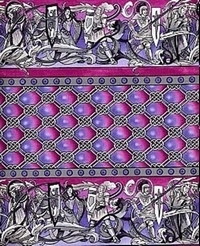 We see Morgan LeFey, Guinevere, King Arthur, Sir Lancelot, Sir Galahad, and other nobles of the court. Leafy scrollwork interlaces the characters and lavish knotwork forms a border above and below them. 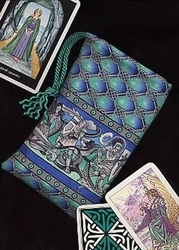 Illustrations dramatizing the age of legends & chivalry adorn this lovely fabric, creating a special home for a tarot deck with a similar theme or an oversized oracle deck featuring multiple cultures. 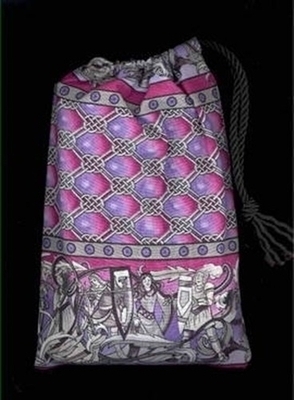 Six different Medieval characters are depicted on each cotton bag: three men and three women. 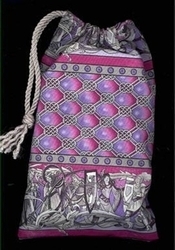 This pictorial bag is made in Wide size, approx. 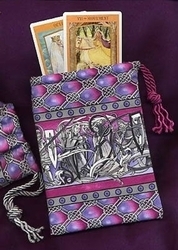 5-3/4 x 8-3/4 inches, and can house an oversized tarot or oracle deck.